“Brazilian foreign policy cannot change.” That is how a Brazilian politician summarized his dislike for the foreign policy of President Jair Bolsonaro and myself. Those views are representative of people who have been so traumatized by the shambolic, far-left foreign policy of the governments of Luiz Inacio Lula da Silva and Dilma Rousseff (2003-2016) that they prefer inaction and indifference to any attempt to make Brazil a global player again. They are so used to bad change that they would rather not risk any change at all. Those people think the only alternative to Lula’s disaster in foreign policy is to think small, repeat United Nations talking points and try to do some trade. They strive for golden mediocrity. They want Brazil to accept “the world as we found it,” to paraphrase the famous expression of Ludwig Wittgenstein. President Bolsonaro was not elected to take Brazil as he found it and to leave it there. He was not elected to take Brazilian foreign policy as he found it, to raise the flag of “pragmatism” perfunctorily, and go home. This is not what the Brazilian people -- thinking, independent selves with their own passions and ideas, and not post-modern automata -- want and deserve. Brazilian foreign policy must change: This is part of the people’s sacred mandate entrusted to Jair Messias Bolsonaro. We are convinced that Brazil has a much larger role to play in the world than the one we currently attribute to ourselves. We want to promote freedom of thought and freedom of expression around the world. This is essential to promote any other sort of change and any other sort of freedom. Bolsonaro’s election in Brazil was only possible because people could freely exchange their ideas and express their feelings unencumbered by mainstream media’s straitjacket. This lesson is priceless. Unfortunately, today’s world has countries where thought is directly controlled by the state. It also has countries, mainly in the West, where thought is indirectly and insidiously controlled by the media and academia, leaving very few places untouched by Wittgensteinian death-of-the-subject oppression. Brazil has now shown that it is possible to break free and, through the sheer force of speech, transform the political reality of a country of 200 million people and peacefully dismantle a decades-old system of crime and corruption with courage, determination and sincerity. And we want, of course, to expand trade. Brazilian trade policy, as part of our foreign policy, has slumbered for too long. We are determined to negotiate trade, investment and technology deals with all our partners, in an ambitious and creative way, exploring different models with different partners, always with the concrete needs of the productive sector in mind. Critics would say that by talking about freedom and democracy, and by taking those concepts seriously, we are ideological. They would argue that the advocacy of freedom and democracy will jeopardize our trade. It would be a sad world if this were the case. But I am convinced that a much more assertive Brazil, a country speaking with its own voice and not just dubbing in someone else’s, will be a much better partner in trade and in any other area. But this doesn’t work. No one respects such behavior, and you don’t reach good trade deals when there is no respect. Look at China. China unapologetically defends its system, asserts its national interests and identity, its specific ideas about the world and everyone does more and more trade with China. Why should other countries be required to sign up to certain ideas before being considered good trade partners? Should we renounce our commitments to freedom and democracy when others are not required to renounce their commitments to their systems? Brazil will show that you can increase your share in international trade and investment flows even as you confidently step onto the world stage to defend freedom, speaking with your nation’s own voice. Brazilian foreign policy can change, and the world can change. We don’t have to take them as we found them. 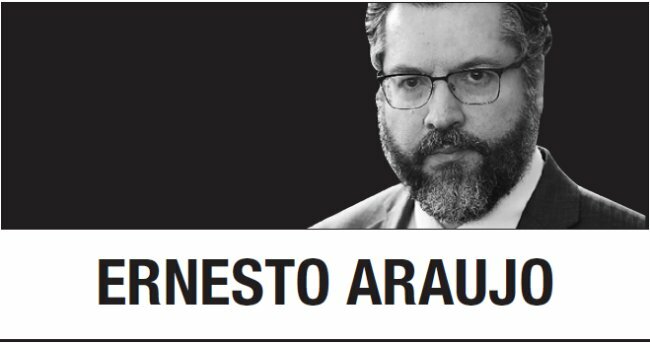 Ernesto Araujo is Brazil’s foreign affairs minister. -- Ed.